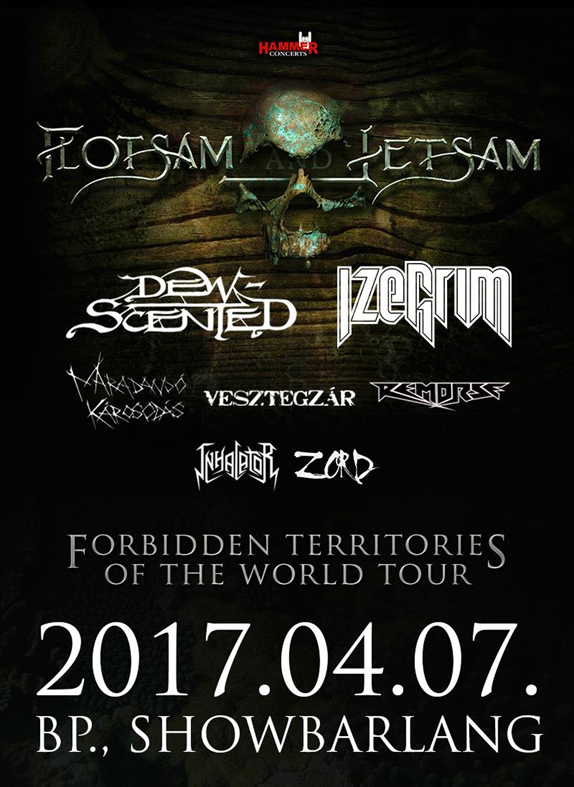 US thrashers Flotsam and Jetsam have announced the 'Forbidden Territories Of The World' European headliner tour with Dew-Scenteed & Izegrim. The metal rampage will kick off on Thursday 23th of March at Plutonium in Strasskirchen, Germany, and will continue throughout Europe hitting Slovenia, Italy, Switzerland, France, Belgium, Germany, The Netherlands, Czech Republic, Poland and Hungary before concluding at Vienna Metal Meeting in Austria on Saturday 8th of April 2017. Five Hungarian thrashers - Zord, Remorse, Maradandó Károsodás, Vesztegzár and Inhalator - will join the show on 7th April, 2017 on two stages at ShowBarlang in Budapest.